Novel and proprietary “off-the-shelf” solution in multiple forms for different applications. TECHNOLOGY. The Aegeria technology was designed and developed to provide a natural structure to mimic normal soft tissue and promote new fat tissue growth in a sterile preparation that has been shown to promote adipose deposition in animal models. This novel and proprietary "off-the-shelf" solution can be prepared in multiple forms (injectable and bulk sheets) for different applications. AegeriaST processes soft tissues harvested from donors using techniques that do not alter their relevant structural characteristics. The tissues also are intended to provide the same basic functions in recipients that they provided in donors. 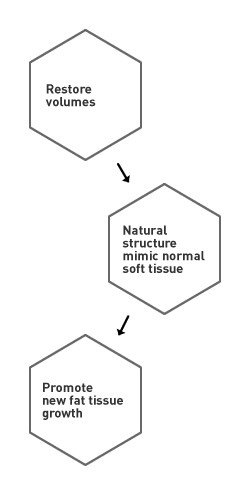 The first product along this line is A3T01, a soft tissue support allograft from human adipose tissue, or fat. A3T01 offers an exciting new alternative to the synthetic or polymer biomaterials currently on the market. The product's physical and biological characteristics are similar to natural soft tissue in the body, and early studies show a strong ability to fill deformities.